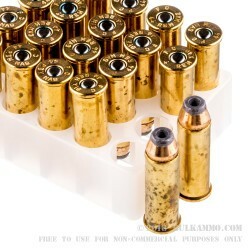 When you buy ammunition from us, you've never got to ask yourself one question: “Do I feel lucky?” That’s because we purvey some of the finest ammunition available on the market, and are always going to give you a great deal. 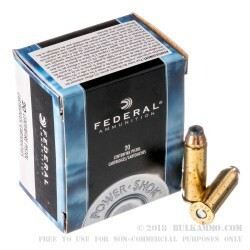 This 44 Mag cartridge by Federal sports a 240 grain jacketed hollow point bullet. With a muzzle velocity of 1,230 fps, this hollow point has plenty of juice to enter and expand within a target for devastating damage. 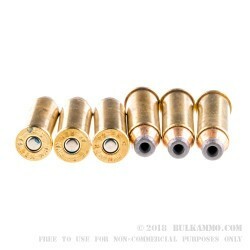 Its penetration is further aided by the bullet’s jacket, which also serves to control the expansion. The core and jacket are very tightly bonded, guaranteeing the kind of weight retention you need for maximum stopping power. Sometimes you can compromise a little on quality when it comes to your ammunition. 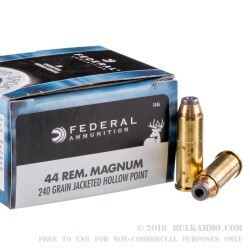 But being as this is a 44 Magnum, the most powerful handgun in the world, it deserves only the very best as Federal can provide it.